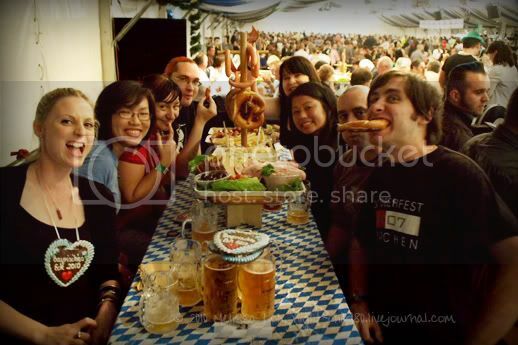 The first year I moved to Brisbane, I missed out on Oktoberfest due to girly hormones. The SO went and saw the birth of a beautiful relationship with his best bud and one of the sweetest girls I've ever met. Last year, we got to go together and had a blast at the VIP tables our friends organised. But this year, as luck would have it, the SO had to miss out due to work travel. That wasn't stopping me from going though. 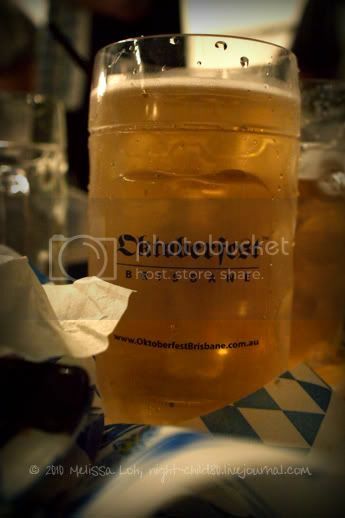 The first thing you gotta do to have an awesome Oktoberfest at the RNA Showgrounds is herd cats. Or at least it must've felt that way for dvoid, but he got it in the end and secured 2 VIP tables. And why would you bother with paying $699 per table (including GST)? It covers your entrance fee. You get your own table on the raised platform, so there's space to move around and dance if the German band tickles your fancy. A cookie, champers and a stein of beer on arrival. Food. Enough said and will be mentioned later. ... and most importantly, the area has its own dedicated toilets. Those toilets are a lifesaver after much beer drinking. Did I mention our group take beer drinking very seriously? Just about the only thing I drank was the lager. 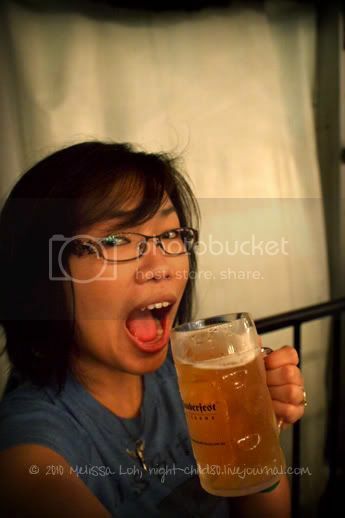 I took a sip of the dark lager and wanted to claw my tongue out. But then again, I'm no beer connoisseur. I gotta say though, our bar wench wasn't as good as last year's. it would be the wait boys carting them over. And she got a couple of orders wrong. 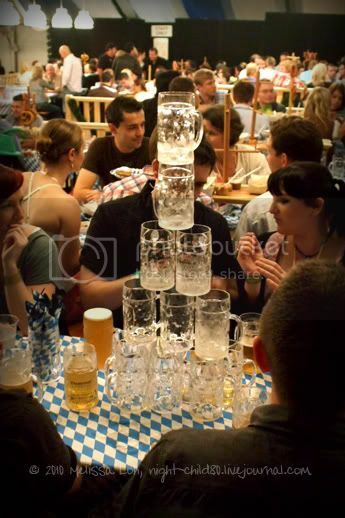 To counteract this lack of service, the SO's best bud ordered 8 steins in one go. It wasn't long before people were offering to buy his beer off him. Food didn't arrive till about 8pm (?) and I was starving. in their fancy shorts and suspenders, if they didn't deliver the grub soon. Having our table right next to the kitchen tent probably didn't help either. And I wasn't the only hungry person. 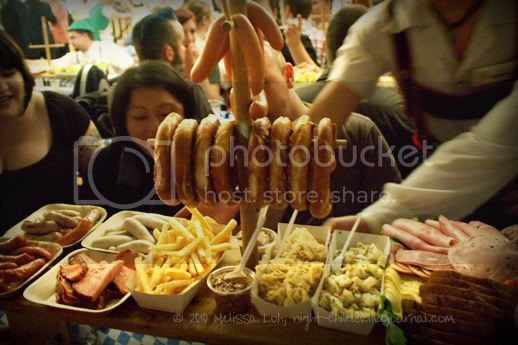 We all dug in with our hands and only realised there was cutlery halfway through eating the lot. I'm drooling just thinking about all that food. and we devoured our spread. The other table had heaps left over. 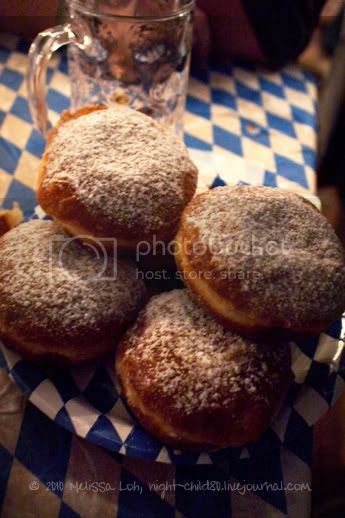 Oh, and the dessert of warm jam filled donuts. biting into one and having the jam squirt out all over my skirt. Nonetheless, it was awesome fun and I must've made a monkey of myself dancing to the cheesiest songs belted by the band. But you know what? Who the hell cares! I was wearing good underwear, everyone had had alcohol, there was space and by god, it's only once a year. And the SO was super nice to jump straight into the car after arriving home from the airport to pick me up, cuz I had copious amounts of alcohol (2 steins, a champers and a schnapps. Basically piss-all by Oz standards) and he didn't want me walking through the Valley in the rain. Very tasty. Would've loved more of the chips, but we were all too stuffed by the end of it to complain.